Contributed by Stephen Narciso, International Parts Sales Rep. I shake my head in amazement every time a box arrives at Duncan Aviation returning units from a core exchange with no thought or care taken to ensure the units are not damaged during shipping. Aviation core returns are often worth tens of thousands of dollars and extra steps are necessary to carefully pack them for shipping. 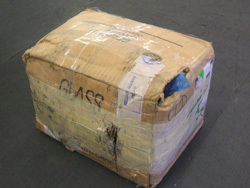 Any damage sustained during the shipping process due to poor packing is not paid for by the shipping companies or insurance. This expense is the responsibility of the customer. 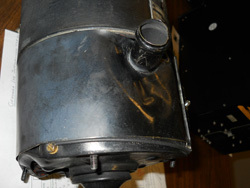 Below are photos of a recent shipment received by Duncan Aviation and an excellent example of how not to ship aviation parts. This small box is barely large enough for just the parts and doesn’t leave any room for padding. Weak boxes provide no protection for units inside. This one might as well have been shipped in a paper sack. Packing all these units into this small box cost this customer more money than it would have if he would have shipped them separately. 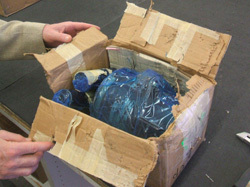 Cellophane wrapping does NOT provide protective padding. Both indicators have been crushed. 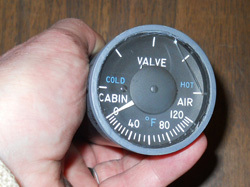 Three units were wedged together in one box resulting in the front glass bezel of this Cabin Indicator to be cracked. This starter generator has taken a brutal beating. 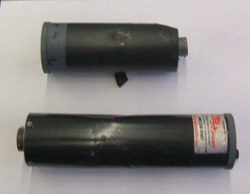 The rear housing, rear-end piece, studs and vent tube are severely dented, crushed or bent. In addition, several pieces of the terminal block have broken off. This customer could have avoided the estimated $15,000 replacement cost with a little more time and effort put into making sure these units were securely protected for shipment. Unbelievable, isn’t it? However, this happens more often than you might imagine. 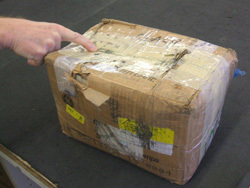 It is pretty simple to avoid these types of shipping problems. For shipping information when shipping parts, avionics, instruments or accessories to Duncan Aviation (whether domestic or international) visit www.DuncanAviation.aero/parts. Duncan Aviation provides extensive repair and overhaul services—including loaners and exchanges—for business aircraft parts, avionics, instruments, accessories and propellers. We maintain a large inventory of business aircraft parts for sale. We also hold more than 70 manufacturer authorizations for avionics, instruments, accessories and propeller units. Stephen Narciso serves as an International Parts Sales Rep. at Duncan Aviation, specializing in consignment contracts and parts requests. He began working in aviation in 1982.